Cyclists continued to choose from 65-, 45- and 35-mile routes at this year’s Tour de Menlo, but the routes were new, with all three turning around at Sycamore Park on Stevens Creek Rd. Many stopped to enjoy refreshments there — energy drinks, water, bananas and cookies — before returning to Menlo-Atherton High School were the ride began in waves starting at 8:00 am. Sandy Simons, Jamie Marks and Kathy Gilles (pictured right to left) headed out together with Kathy being the most experienced Tour rider. “This is my fourth or fifth tour,” she said. Another change this year was the post-race BBQ lunch at M-A’s courtyard, which many riders seemed to think was a good idea. “It was sometimes hard getting back on the bike after lunch at Picchetti,” commented one about the usual mid-ride eating place. The 500 or so riders who participated came filtering back starting around 11:30 am. They were greeted by the sounds of the San Francisco Bay Jazz band, also new to the ride. 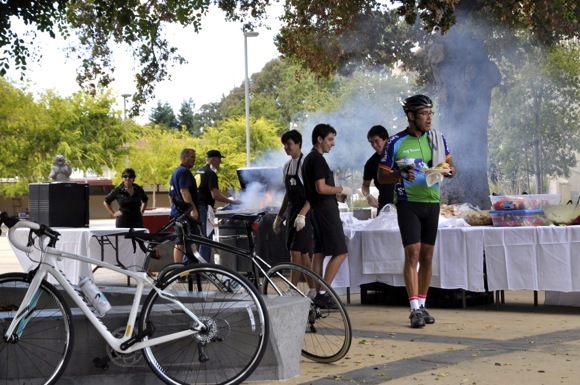 The Tour de Menlo is sponsored by the Rotary Club o Menlo Park Foundation and the Almanac. Proceeds support Rotary scholarships, other Foundation projects, and the Almanac’s Holiday Fund drive.